[S234] George Brown, "The Descendants of William and Elizabeth Tuttle," database made available on-line courtesy of George Brown, http://wc.rootsweb.com/cgi-bin/igm.cgi?op=GET&db=gmb633&id=I08720, database put on-line 21 February 2009. [S408] Susan Rockwood Bradley, "Susan Rockwood Bradley," database made available on-line courtesy of Susan Rockwood Bradley, http://wc.rootsweb.com/cgi-bin/igm.cgi?op=GET&db=velvet49&id=I01808, database put on-line 27 August 2008. [S237] Leonard Abram Bradley, compiler, History of the Ball Family - Genealogy of the New Haven Branch; Allen Ball and Some of His Descendants 1638-1864 (New York: privately printed, 1916). [S241] Donald Lines Jacobus, compiler, Families of Ancient New Haven (Baltimore MD: Genealogical Publishing Company, 1974 (originally published by Clarence D. Smith, Rome, New York, 1923)), vol. 1, p. 111. [S241] Donald Lines Jacobus, compiler, Families of Ancient New Haven (Baltimore MD: Genealogical Publishing Company, 1974 (originally published by Clarence D. Smith, Rome, New York, 1923)), vol. 1, p. 108. [S52] Jacquelyn Ladd Ricker, compiler, The Ricker Compilation of Vital Records of Early Connecticut (Baltimore, Maryland: Genealogical Publishing Company, 2006). [S241] Donald Lines Jacobus, compiler, Families of Ancient New Haven (Baltimore MD: Genealogical Publishing Company, 1974 (originally published by Clarence D. Smith, Rome, New York, 1923)), vol. 1, p. 109. [S241] Donald Lines Jacobus, Families of Ancient New Haven, vol. 1, p. 110. [S241] Donald Lines Jacobus, compiler, Families of Ancient New Haven (Baltimore MD: Genealogical Publishing Company, 1974 (originally published by Clarence D. Smith, Rome, New York, 1923)), vol. 1, p. 107. [S582] Joanne Todd Rabun, "The Gene Pool Annex," database made available on-line courtesy of Joanne Todd Rabun, http://wc.rootsweb.ancestry.com/cgi-bin/igm.cgi?op=GET&db=jtr-todd&id=I9024, database put on-line 31 August 2005. [S241] Donald Lines Jacobus, Families of Ancient New Haven, vol. 1, p. 109. The town of Ballston derives its name from Rev. 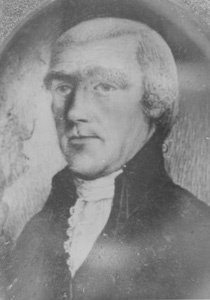 Ball, a Presbyterian clergyman, who in 1770 removed from Bedford, Westchester County, NY, and settled on a lot of five hundred acres presented to him as an inducement to settle by the proprietors of that portion of that Patent.7 Photo of the portrait is made available courtesy of the Town of Ballston Historian's Office, Ballston, Saratoga County, New York. [S241] Donald Lines Jacobus, Families of Ancient New Haven, vol. 1, p. 108. [S903] Find A Grave - A User-Contributed Listing of Cemeteries and Memorials; Find A Grave Founder Jim Tipton, 2009; online at http://www.findagrave.com/cgi-bin/fg.cgi?page=gs&, Briggs Cemetery, Ballston Spa, Saratoga Co., NY. [S1975] William L. Stone, compilers, Reminiscences of Saratoga and Ballston (New York: R. Worthington, 1880).